While most adults recognize that everything they read on the internet isn't true, teens are much more gullible. They're more likely to believe 'fake news' and they have trouble distinguishing advertisements and entertainment from news. A Stanford University study found that 82 percent of middle-schoolers can’t distinguish between sponsored content—even when it was labeled as such—and a real news story. And when it comes to judging the credibility of a story on social media, the study found teens based their reasoning on the size of the graphic image. Many of them concluded a larger photo meant the story is more credible. Clearly, the fact that today’s teens are digital natives doesn’t mean they grasp basic media literacy. Many of them don’t understand how to critically think about the content they're viewing. On average, teens spend nine hours per day using their electronic devices. That means teens are bombarded with advertisements, news, and social media messages much of their waking hours. Body dissatisfaction – Models and celebrities often exemplify unrealistically thin or overly muscular bodies. Studies show teens who lack basic media knowledge tend to feel bad about themselves after viewing these images. They don’t realize photos are often photoshopped and teams of people work to ensure celebrities and model appear perfect. Consumer ignorance – Teens who don’t recognize sponsored content won’t recognize that the ‘story’ they’re reading isn’t news—it’s just a marketing tactic. They might be more likely to buy products and services they don’t need. Stereotyping – The media often stereotypes people based on gender, religion, or ethnicity. Being subjected to stereotypes repeatedly, without thinking about it, means teens are more likely to believe what they see. Bias – Media outlets have an agenda and they’re operated by humans who have biases of some type. But teens who don’t understand bias may be only getting one side of the story. Health problems – Marketers use a variety of tricks to lure people into thinking unhealthy behavior is a good idea. Drinking may be portrayed as ‘cool’ and junk food may be marketed as ‘fun.’ Teens may be more likely to engage in those unhealthy behaviors if they don’t recognize the strategies advertisers use. Encourage critical thinking. Encourage your teen to question the information she's reading. Ask her to consider who write the story and why that person may have written it. Discuss advertising techniques. Talk about the tactics companies use to convince people to buy their products. Promising a product will help you look beautiful or be more popular, for example, is often part of the message. Talk about people’s motives in creating content. Make sure your teen is aware that many writers get paid by the page view. Click-bait headlines are intended to get traffic, rather than provide quality information. Explain how many other writers are trying to sell products, rather than report the facts. Teach your teen to look at all the information. Talk about the importance of looking at the “about us” page on a website to learn more about who produced the content. Also, show your teen how to look at photographs more closely. Just because a picture is paired with an article doesn’t mean the picture was taken at the actual event being discussed in the story. Discuss the importance of comparing sources. Talk about ways to fact check stories online. Are other media outlets running the same story? Where did the original story come from? How does the same story differ across different outlets? Monitor your teens use. Know what social networking sites your teen uses and monitor your child’s online activity. Also, pay close attention to the movies your teen is watching and the music she enjoys. The more you know about what she’s consuming, the better equipped you’ll be to have discussions about how media is likely to impact her. Look at websites together. Sit down with your teen and review popular news sites and discuss how to differentiate between news stories and sponsored content. Read articles together and talk about the messages that you’re seeing. 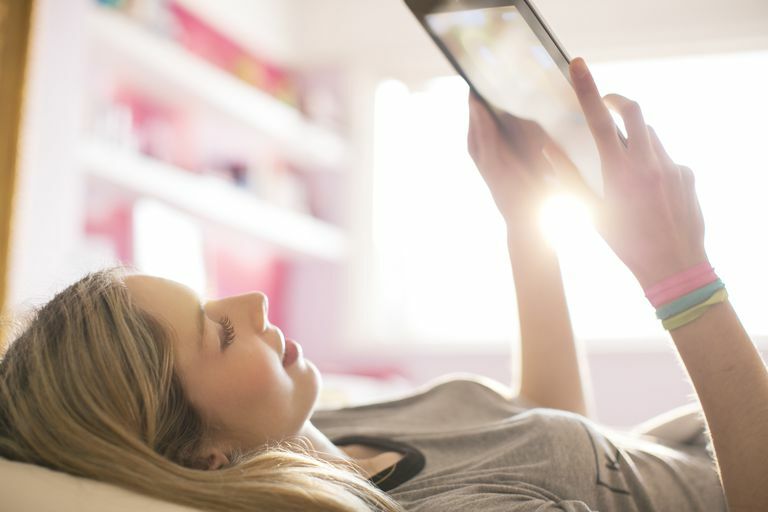 Make media literacy an ongoing topic of conversation in your home. Use real-life examples and news stories whenever you can and plan to make media literacy an ongoing conversation. Donald, Brooke. Stanford researchers find students have trouble judging the credibility of information online. Stanford Graduate School of Education. Krayer A, Ingledew DK, Iphofen R. Social comparison and body image in adolescence: a grounded theory approach. Health Education Research. 2007;23(5):892-903. doi:10.1093/her/cym076. Which Table Manners Should You Teach Your Kids Today?